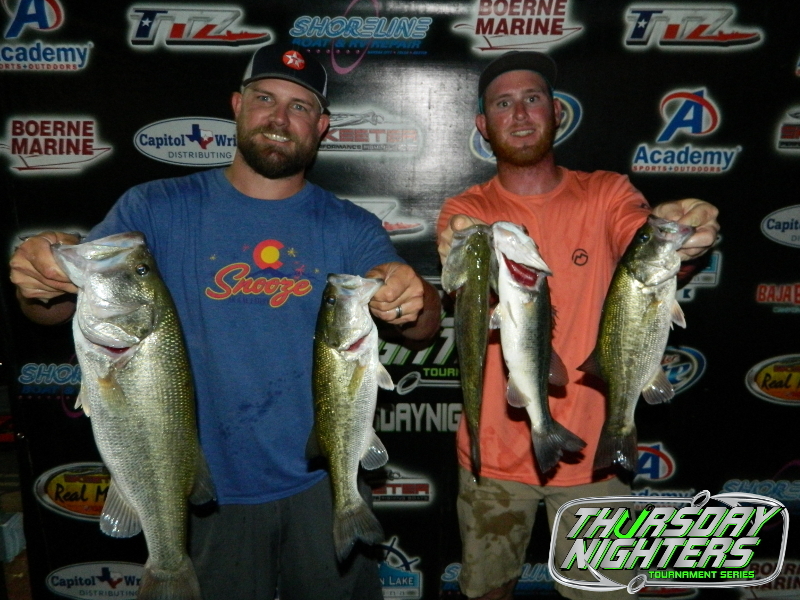 CANYON LAKE, TX – A new record field of 70 teams showed up to beat the heat and each other on a calm Thursday evening. We cannot stress fish care strongly enough and it should be of your upmost importance. With warmer water in your live wells you need to use treatments or ice as well as a fizzing your fish as more and more anglers are catching fish deeper and deeper. 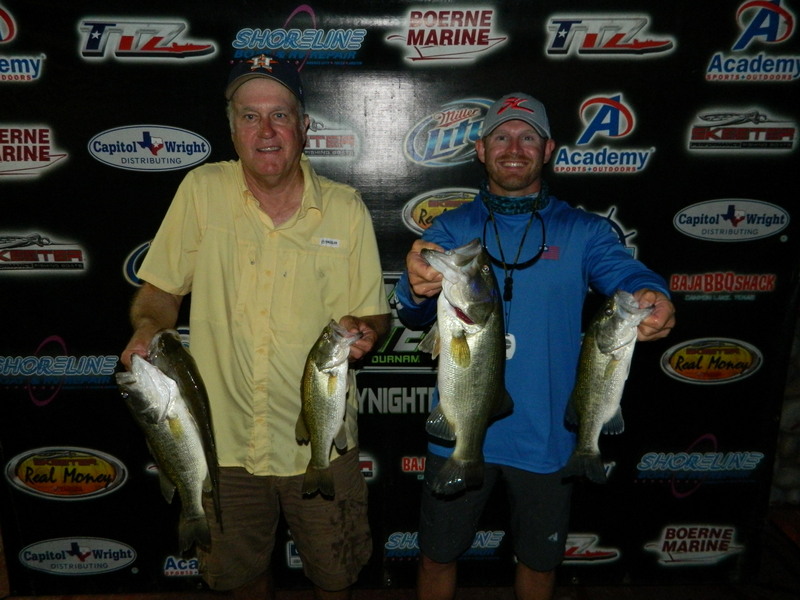 Taking the $1080 first place prize was the team of David Jara and Daniel Rodriguez. 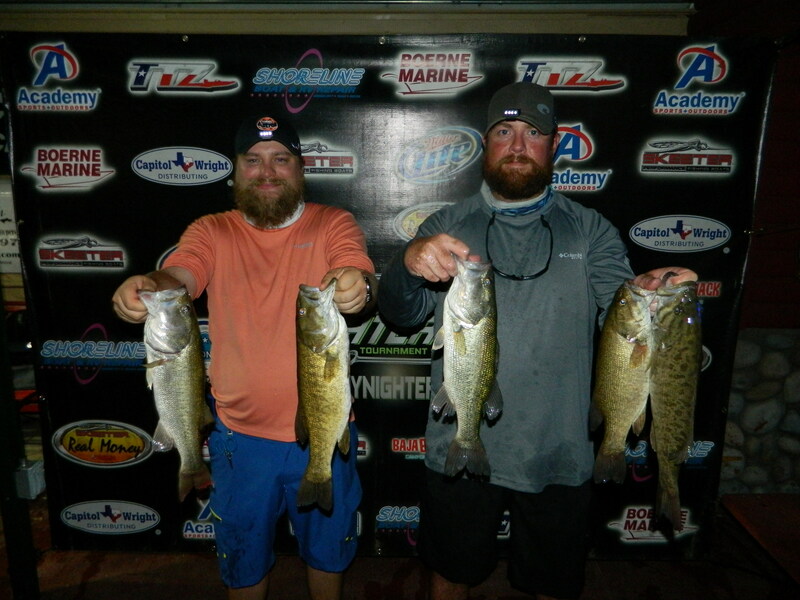 David said they had 1 keeper by 9pm that they had caught earlier in shallow water on a topwater. 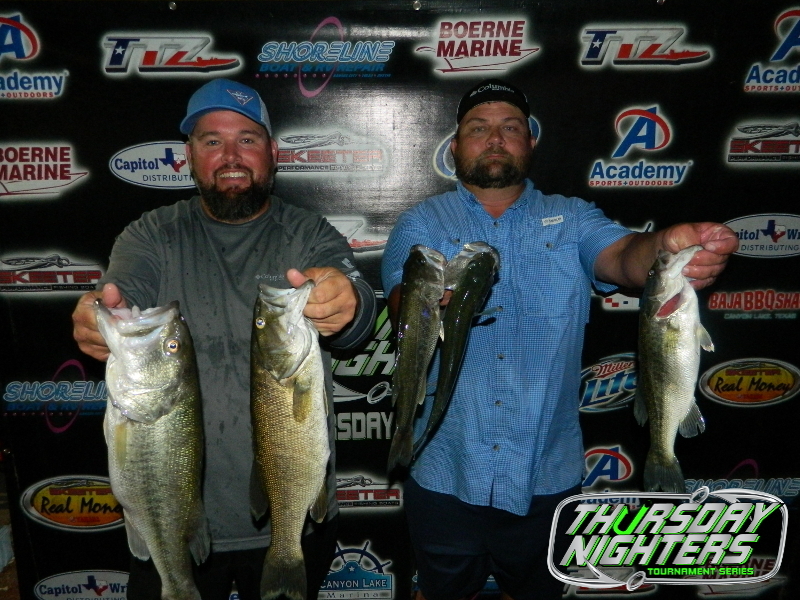 It wasn’t til the dark of the night that they found the bite filling out their limit and culling a couple of times. 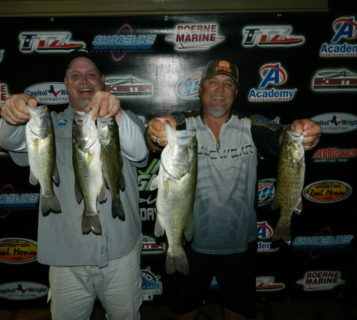 David said they were fishing deep deep water with texas rigs. It is the teams 1st win of 2018 and 2nd win in the last 2 seasons, but 11th win over all. 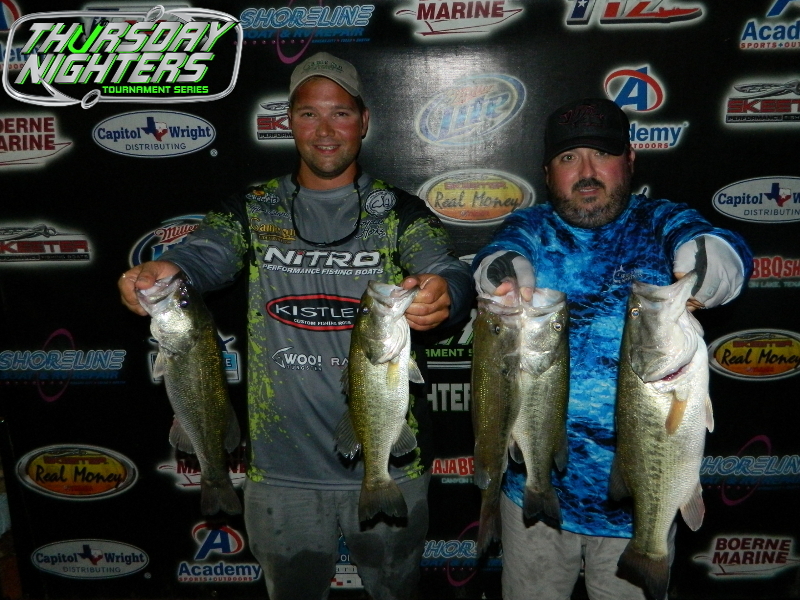 The team also won Big Bass with a solid 5.70 pounder that earned them an additional $350 to bring their total to $1430. 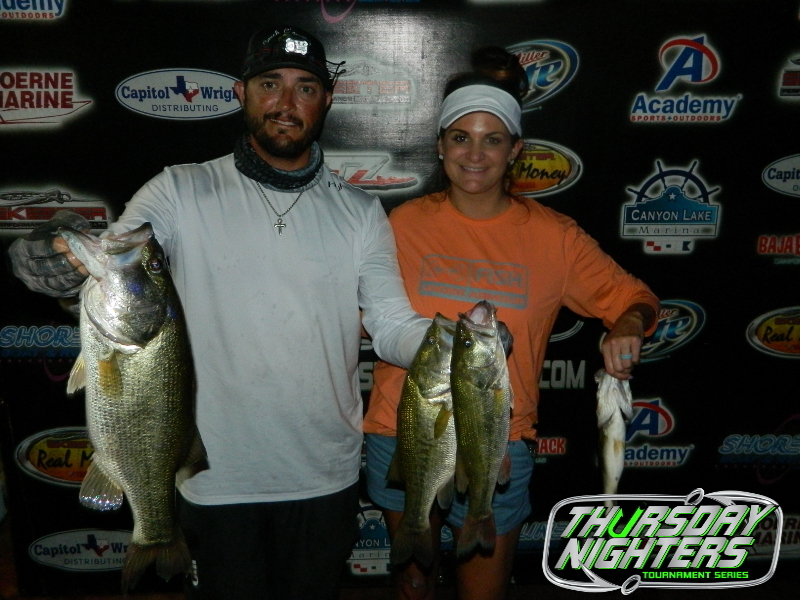 Coming in 2nd place, fishing his fourth event of 2018 was Randall Nichols with his wife fishing her first Thursday Nighters event Natalie Nichols. 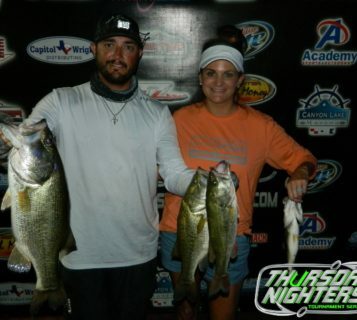 The team said they caught a lot of fish and a lot of keepers with most on topwater then Natalie would cull out a few fish throwing flukes from the back of the boat. 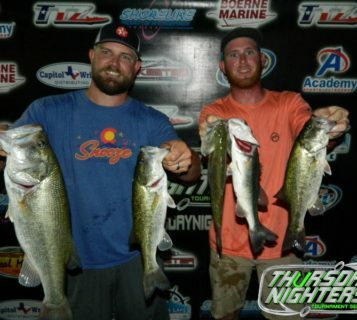 They stayed shallow all night and caught fish all night long doing it. 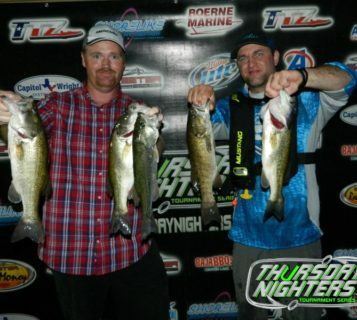 It was the teams first payday and a good one taking home over $600. 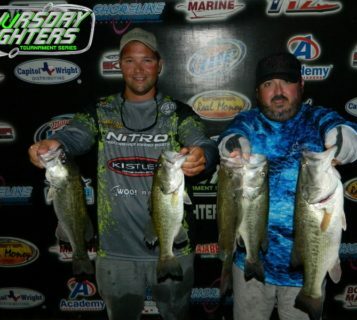 3rd place went to Kyle Ford and Mike Valerio. 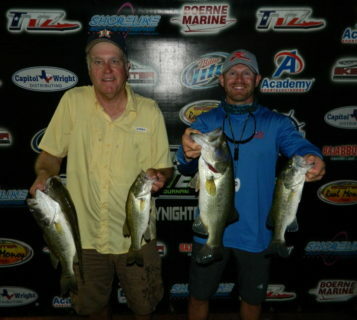 They said they caught fish all over the lake but started in deep water in the 25-30’ range to pick up a couple of keepers early, then bounced around and were able to fill out a limit. 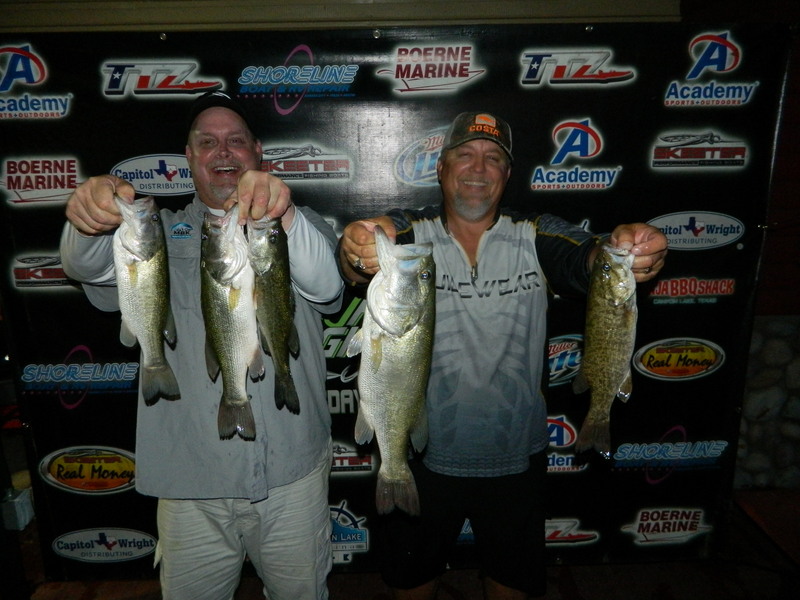 They threw dropshot and tx-rigs in deeper water then said they were able to pick up a few on topwaters late. 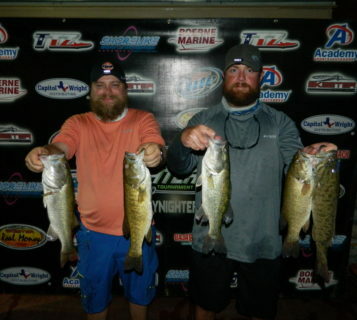 The team led the event for most of the weigh in as they were boat #6 and one of the first teams back and was looking pretty good until the last 10 minutes of weigh in. 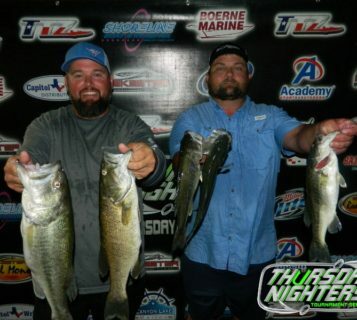 Topwaters are starting to produce! 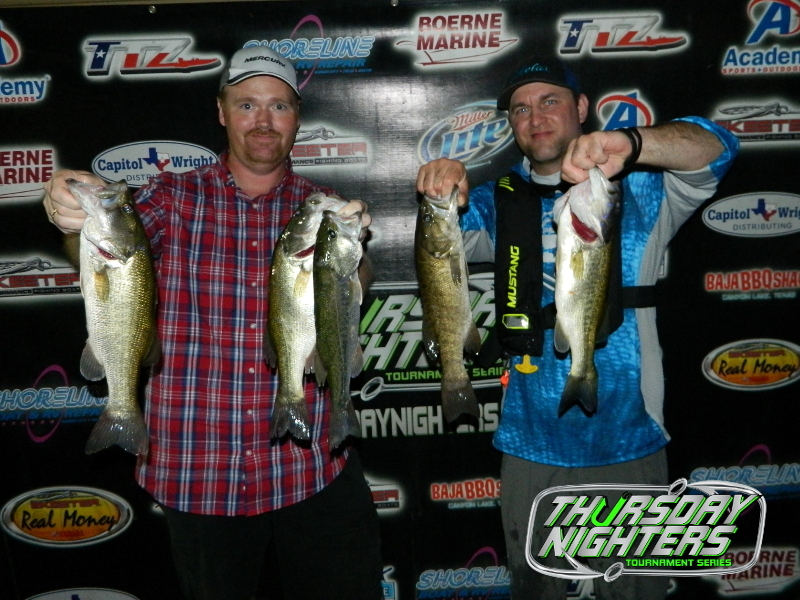 Frogs, poppers, spooks, and buzzbaits were all working last night with the water temps now in the 80’s. 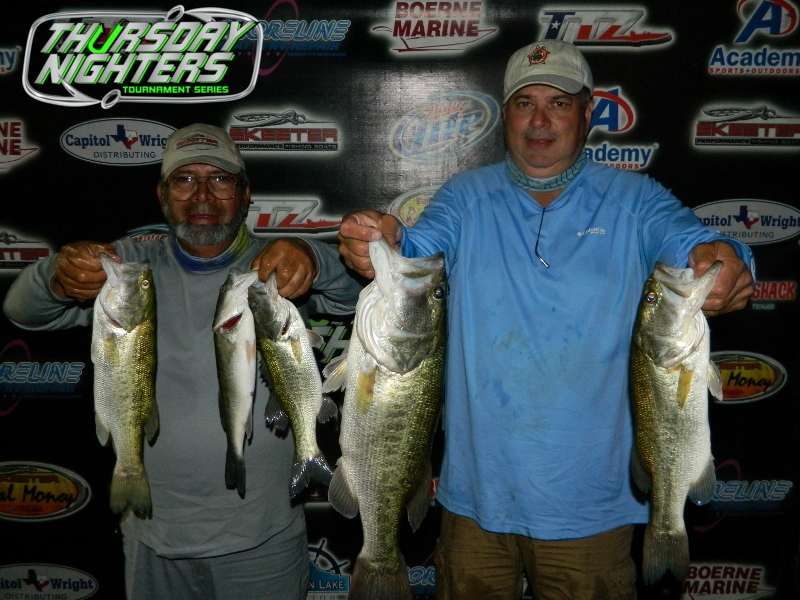 Dropshot and Texas rigged rig soft craw imitation plastics are working best in deeper water. As usual there are still fish shallow and there are now a lot of fish deep. 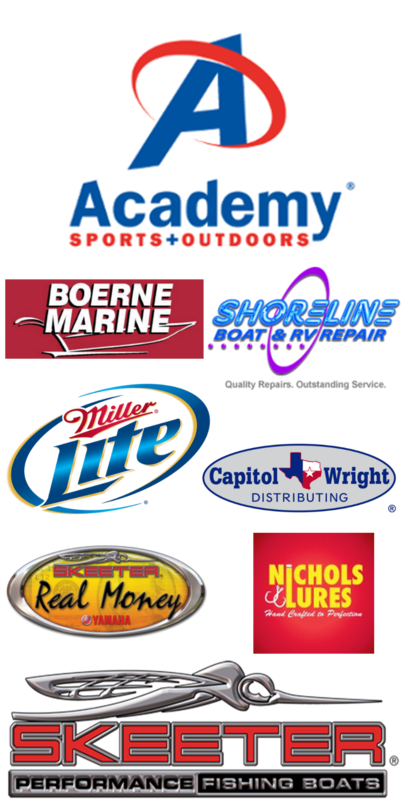 You’ll need to cover a lot water if fishing shallow as fish are scattered, and slow down and fish slow when fishing deep. Rock seemed more important than brushpiles, in fact no one has reported to have done well on any brushpiles so far this season.